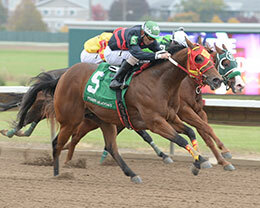 Ferrari James, under jockey Oscar Delgado, drives to victory in the 108,497 Altoona Derby Saturday at Prairie Meadows. ALTOONA, IA�OCTOBER 15, 2016�Fastest qualifier Ferrari James was bumped at the start but rallied under jockey Oscar Delgado to defeat Divas Candy Girl by a neck in the $108,497 Altoona Derby Saturday afternoon at Prairie Meadow.. Prized Wagon finished a neck back in the blanket finish to take third. Racing for owner Alfredo Botello and trainer Manuel Campos Ferrari James covered the 400 yards in :19.925 seconds into a 15 mph crosswind. It was the second the derby win of the season at Prairie Meadows for the son of IVORY JAMES who won the Iowa Gold Derby in September. Bred in Oklahoma by Weetona Stanley and W.E. Smith, from the Mr Jess Perry mare Ferarri Fast Prize, Ferrari James earned $49,399 to boost his career total to more than $150,000. Also a stakes winner, Divas Candy Girl put in a belated rally under jockey Brayan Velazquez to earned $18,444 for owner Thomas Scheckel. Jason Olmstead conditions the filly . Bred in Oklahoma by Carl Pevehouse and Ezra Lee, Divas Candy Girl is a sister to four-time AQHA Racing champion Spit Curl Diva. She has eared nearly $80,000. Joel Rod Pierce's Prized Wagon earned $10,850 for his third place effort. Gina Downing trains the colt. Robert and Karen Nunnally bred the multiple stakes-placed 3-year-old in Texas. He has earned $179,251. Flare For Ivory, Tee Chic, Mazzimo, Freighttrain V, Justified, Pyc Tyme and Macgyver Moonflash completed the field.